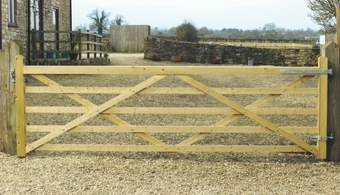 We get our Five Bar gates from Charltons, the market leader within the wooden 5 bar gate market. 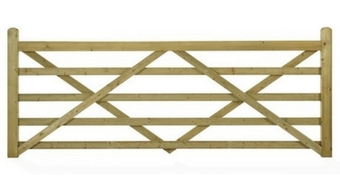 Whether its for a field entrance gate to a gate that enhance the entrance to a property, the Highgrove option covers all uses. The Highgrove has a universal design with two 4’’ x 3’’ stiles allowing it to be hung from either end. The straight domed top bar is assembled by traditional mortice and tenon joints which are supported by a robust diamond bracing. the Highgrove is made from a slow grown scandinavian kiln dried softwood, and planed to ensure a smooth attractive finish. Its diamond bracing has stainless steel fixings and is mounted into the domed top bar providing further strength and stability to this universal gate. The Highgrove is pressure treated for durability.